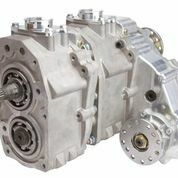 Looking to get rid of your chain-driven t-case and upgrade to a gear-driven transfer case without the hassle and expense of installing a new axle? Trail-Gear has the answer to your problems with our new Verso™ T-Case Adapter. 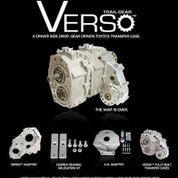 The Verso™ T-Case Adapter allows for the use of a gear- driven t-case with a driver-side drop front axle. The Verso™ T-Case Adapter is machined out of aircraft-grade 6061-T6 aluminum for increased strength and durability. The Verso™ T-Case Adapter has almost a quarter inch of added material around the idler gear bearing for additional strength. The Verso™ T-Case Adapter can be used in a single or dual case application.  More aftermarket gearing options giving you more control while wheeling.  Allows for the use of a front axle housing with a driver side drop (example: Dana 44 or dana 60 front axle).  Ability to use dual transfer cases, giving you a lower gear ratio to tackle the most extreme trails. The Verso™ T-Case Adapter includes all necessary hardware to install onto your gear-drive transfer case. 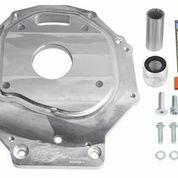 To go even further, we will include a Mechanical-to-Electrical Speedometer Adapter with this kit at no additional cost! Note: Please read Verso/4.0L FAQs before ordering. Note: Will require driveline modification if you are using a dual case adapter. Dual cases will require floorboard modifications to your vehicle. This product cannot be installed on a chain- drive t-case. If you do not have a RF1A gear-drive transfer case, you will need to obtain one. Notice: This kit requires above-average mechanical skills to correctly install. We recommend that installation be performed by a competent mechanic. Read the installation instructions and contact Trail-Gear technical services with any questions you may have before ordering this product. 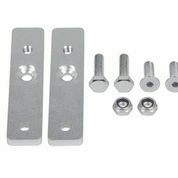 This adapter plate kit allows you to mount one or more gear driven transfer case(s) in your 4.0L 2005-2014 Toyota Tacoma with an A750F automatic transmission and other vehicles with Toyota A750F automatic transmissions. The adapter plate is CNC machined from 6061-T6 Aluminum at the Trail Gear headquarters. Vehicle modifications required for installation include: lengthening the front and shortening the rear drive shafts, additional floorboard hole for the second transfer case and crossmember replacement. 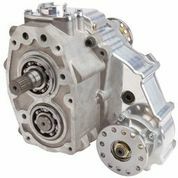 Our design does not require modification to the transmission for installation. 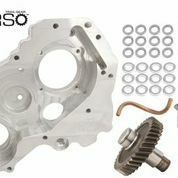 Note: One RF1A top shift gear-drive transfer case will be needed to perform this conversion with our Verso™ Adapter. For dual cases, both cases need to be top shift. Also required is a 23- spline 2.28 input gear.  Tacoma Transfer Case Shifter Kit (coming soon or you will need to fabricate your own). Note: This kit requires cutting through the floorboard shifter console for the t-case shifter. Read the Tacoma transfer case shifter installation instructions before purchasing to see the modifications that will need to be made to the shifter console. Our Carrier Bearing Relocation Kit is designed to shift the driveline carrier bearing back 1-1/8” to account for the thickness of the 4.0L Adapter Plate. The hardware and brackets in our Carrier Bearing Relocation Kit are made out of zinc-plated steel. Note: This kit is required if you are installing a 4.0L Adapter plate onto your transmission with a gear drive transfer case. Important: Read the Verso/4.0L FAQs on our website before ordering.  Allows for the use of a front axle housing with a driver side drop (example: Dana 44 or Dana 60 axle). Note: Will require driveline modification if you are using a dual case adapter. Dual cases will require floorboard modifications to your vehicle. Verso fully built t-cases for Tacoma trucks will be supplied with Tacoma Triple-Drilled Flanges installed. You will need to purchase 11mm Driveline Bolts if you do not already have them (Tacoma only). Dual RF1A top-shift gear-drive transfer case that features a 4.70 low range gear set built with our very own Verso™ Transfer Case Adapter. The Verso™ T-Case Adapter allows for the use of a gear-driven t-case with a left hand drop front axle. The Verso™ T-Case Adapter is machined out of aircraft-grade 6061-T6 aluminum for increased strength and durability. The Verso™ T-Case Adapter has almost a quarter inch of added material around the idler gear bearing for additional strength. Each case is fully rebuilt and inspected. Triple drilled flanges are installed on both front and rear output. This Verso™ 2.28 x 4.70 Dual Transfer Case is built with a 23-spline input gear. Can be installed as a replacement to your stock chain driven transfer case. To go even further, we will include a Mechanical-to-Electrical Speedometer Adapter and your choice of shifters with this kit at no additional cost! The shifters will be provided uninstalled. Available with an adapter for 3.0L, Tacoma 2.7L, 3.4L, and 4.0L applications (transmission adapters are provided uninstalled). Note: Will require driveline modification. Dual cases will require floorboard modifications to your vehicle. Verso fully built t-cases for Tacoma trucks will be supplied with Tacoma Triple-Drilled Flanges installed. You will need to purchase 11mm Driveline Bolts if you do not already have them (Tacoma only).